Fashion model Geena Rocero became a new kind of model when she revealed publicly for the first time that she was trans on the renowned TED stage. Now, as she continues to tell her story and discuss the challenges of living a life true to one’s inner self, she serves as a symbol of strength, pride, and acceptance inside and outside of the trans community. Geena Rocero, born and raised in Manila, Philippines, is a model, producer, trans rights advocate, and co-host of the TV show ASPIREist. 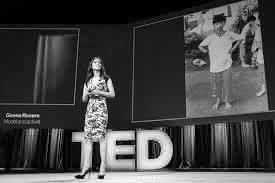 On March 31, 2014, in honor of International Transgender Day of Visibility, Geena came out as transgender at the annual TED Conference. Her viral talk has since been viewed more than 3 million times and translated into 32 languages. Geena is the founder of Gender Proud, an advocacy and media production company that tells stories to elevate justice and equality for the transgender community. Gender Proud has produced acclaimed documentaries Beautiful As I Want to Be (about transgender youth), Willing and Able (about transgender employment), and No League of Their Own (about transgender athletes). Geena has spoken at the White House, World Economic Forum, and the United Nations, and has been featured on E's I am Cait, Vanity Fair: Trans America, Marriott's #LoveTravels ad campaign and CoverGirl Cosmetics’ #GirlsCan Campaign. Most recently, she was on the cover of Harper's Bazaar India and featured in MAGNUM Ice Cream advertising. Geena has been featured on CNN, Al Jazeera America, MSNBC, Today Show, HuffPost Live, New York Magazine, Mashable, Glamour, Cosmopolitan, Vanity Fair, Elle, Entertainment Weekly, People, Variety, MTV, and many others.